WILLOW GROVE, Pa. -- Police in Montgomery County are investigating the torture of a young dog who was found dead on the side of a road. The remains were found in the area of Welsh Road and Blair Mill Road in the Willow Grove section of Upper Dublin Township. The female Pit Bull Terrier, believed to be between six months and one year old, was found inside a metal crate that was wrapped in plastic and sealed with tape. Police say pieces of drywall were used as the bedding for the crate. 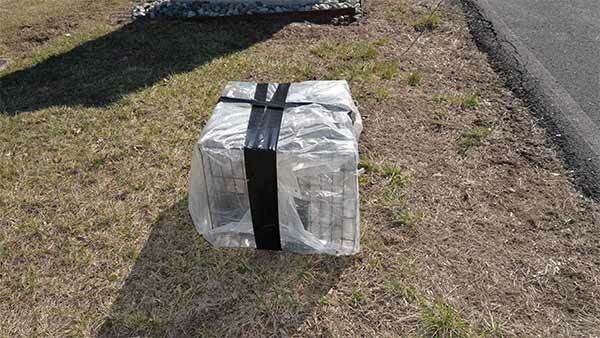 The Upper Dublin Township Police Department posted a picture of the crate on their Facebook page on Wednesday. Upper Dublin police and the Montgomery County SPCA are investigating. Anyone with information is asked to contact the UDPD Detective Division at 215-646-2101.